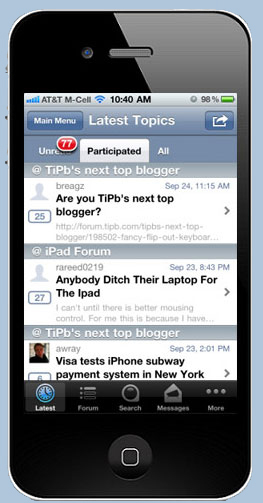 Tapatalk is a smartphone app in the Social Networking category, that allows you to connect with various online forums. It's available for $2.99 and has versions that work with the iPhone, Android, Blackberry and Nokia. I installed a plugin on our Raider Nation Podcast forum that allows it to be accessed with Tapatalk. I registered our forum with them, so we are now in their directory of forums. I've been playing around with this app, and it's not too bad. Much better than trying to access the forum using a browser, like Safari on my iPhone. Some important notes though if you're thinking about trying it out. â€¢ Make sure you log into the forum using the "Login" button on Tapatalk. If you aren't logged in, it gives you a different, much more confusing look. â€¢ After you launch the Tapatalk app, find Raider Nation Podcast forum, and log in, go to the "Settings" tab at the bottom right of the screen, and IMPORTANTâ€¦.set the "Thread LANDING BEHAVIOR" to "Latest Post". If you don't do this, when you go to a thread on the forum, it will take you to the very first post in that thread. If there are dozens of posts in that thread, you may be reading a post from over a year ago, and you'll have to scroll through all of them to get to the most recent posts. This was very confusing for me using this app before I discovered that setting. Also, when you're using the forum on your computer, make sure you make this same setting in your PROFILE section, under "Look and Layout Preferences". Put a checkmark under "Show most recent posts at top" if it isn't already set that way. I usually checkmark that for new members myselfâ€¦so you're probably already set up that wayâ€¦but if not you can set it yourself. I don't know why anyone would want the oldest posts at the top, but if you do you can set it that way. I think that's about it. Oh, one more thing. I changed the forum registration requirements. Before, in order for someone to join the forum, they had to fill out the info, then the forum software would send them an email with a link they had to click on before their forum account would be activated. I did this to help reduce the number of spammers trying to join the forum and sell stuff. I removed that restriction to make it easier for people using Tapatalk to register for the forum from within that Appâ€¦without having to click on an email link. Now, as soon as you fill out the registration screen you are a member of the forum. You just have to log in with your username and password. If you make a mistake 3 times in a row on your password, it will either give you your password hint (if you set one), or it will email you a new password automatically. I'll have to monitor new member closely now. If I see an suspicious ones that look like they're trying to sell stuff or are up to no good I'll delete their account. Go ahead and try Tapatalk if you think it will be useful to you to be able to access the forum while on the go with your smartphone. It makes it a lot easier to post to the forum. It was practically impossible to do using Safari on my iPhone without this app. This isn't our App. We're not making any money from it. Someone asked me if an app existed that would do this, so I found it and set up the forum to use it.